Everyone wants a certain drama in a story. The luminous Easter begins with a predawn darkness with women on their way to the tomb to mourn Jesus’ death. At the opened tomb, an angel announces to them that “Jesus has been raised from the dead” and they are to tell the disciples the good news. Matthew quickens the pace and tempo of the story by telling us that the women ran, fearful and overjoyed. The mingling of both fear and joy can be likened to the feelings of someone about to be married — they are overwhelmed with excitement and awe because someone finally made a commitment to them; and at the same time, afraid because the new commitment will bring about changes in the future. It is a good fear, as we ‘fear the Lord’ — our relationship with God can bring about changes in our lives. But we happily choose to take the risk. These two feelings are also experienced by people who finally decided to follow their vocations in life, despite the protests of their parents; or by young couples who have entered into a committed companionship; or by many students who have transferred from a course chosen by their parents to a field of study they actually want. Finally, while running to the disciples, Jesus met them on their way. Having seen Jesus, their joy became complete: they paid him homage and began to be living testimonies of the resurrection. In other words, Matthew conveys the feeling of overwhelming joy and happiness at the resurrection. This resurrection joy becomes a central emotion in the Christian faith. In our lives today, the vocation of a Christian is to share this Easter joy! However, we do find barriers that prevent us from experiencing joy. Why is it difficult for us to share the joy of others? We know of instances when we find it hard to share the good fortune of others. Envy prevents us from sincerely celebrating with them. We also experience people who dampen our happy spirits. Take for example a personal experience. After the most beautiful Easter vigil liturgy in UP, I greeted someone who was disturbed by hosts flying to the ground because of the industrial fan. The concern was legitimate, but I felt that there was something wrong. After giving it a thought, I realized that the disposition was disturbing: when the whole faith community was happily greeting everyone a happy Easter, I felt that the person was not one with our joy! While we were all celebrating, the person took the pew and quietly prayed — despite the 2.5 hours of liturgy! There was no comment about being moved by the liturgy, nor about the three adults who decided to become Catholics and had themselves baptized. Furthermore, that person dampened my Easter joy! The concern was legitimate but the timing was inappropriate. But this is not just one person: it is a developing culture. We do have tendencies to be ‘KJ’ (kill-joy). We find ourselves better when we have noticed a single mistake when no one has noticed it. Many of us are not at ease with joy — when it comes to faith, our comfort zone lies with suffering. It is a type of Christianity that is gloomy, colorless, cautious, rigid and rule-oriented. We associate overwhelming joy with secularity. We think that ‘appropriate behavior’ at mass is to be petrified or fossilized — notice how many people don’t participate at mass despite the continued plea of Vatican II’s Sacrosanctum Concilium. These are the people who dampen the joy of worship. Almost killing the excitement of a community in a celebration. Worse, they have been the common reason why people join groups with animated worship eventually leaving the Catholic fold. When we ourselves prevent people from experiencing joy, we unconsciously deny the effect of the Resurrection, making Easter irrelevant to our lives. 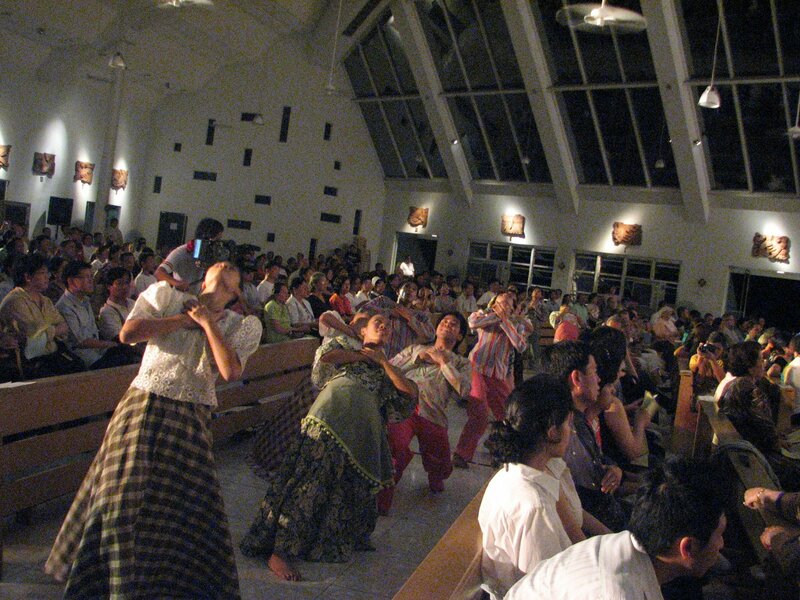 *The UP Filipiniana Dance Group at the Church of the Gesu, Ateneo de Manila University. Choreography is done by Van Manalo.